Michel (Jean-Claude Aimini) works as a technician at a television station where one day he picks up two starstruck teenage girls Liliane and Juliette (Yveline Cery and Stefania Sabatini), and begins casual affairs with both of them. At first, neither realise that the other is seeing Michel and they independently fall in love with him. The film follows several successive dates and experiences he has with them separately and together; however when the girls discover that he has been seeing them both, jealousies and petty arguments begin to tear their triumvirate relationship apart. Michel goes to Corsica to escape the girls and to his increasingly complicated life. They follow him, however, to his holiday camp and convince him to chase after a film director who owes him money, who also happens to be filming nearby. They travel by car to search for the film director, but their close proximity now only exacerbates their romantic situation and Michel finds himself flip-flopping between the girls as their jealousy and arguments mount. However, like many youthful love affairs, the situation ends in limbo, with the girls standing on the quayside and Michel aboard a boat bound for Algeria and National Service. Jacques Rozier is one of the lesser known of the Nouvelle Vague directors, and this, his first feature, is probably his best-known work. Using improvisation and a cinema verité approach, he endeavoured to bring a sense of realism to his stories, most of which, like this one, are concerned with the mixed up lives of teenagers. 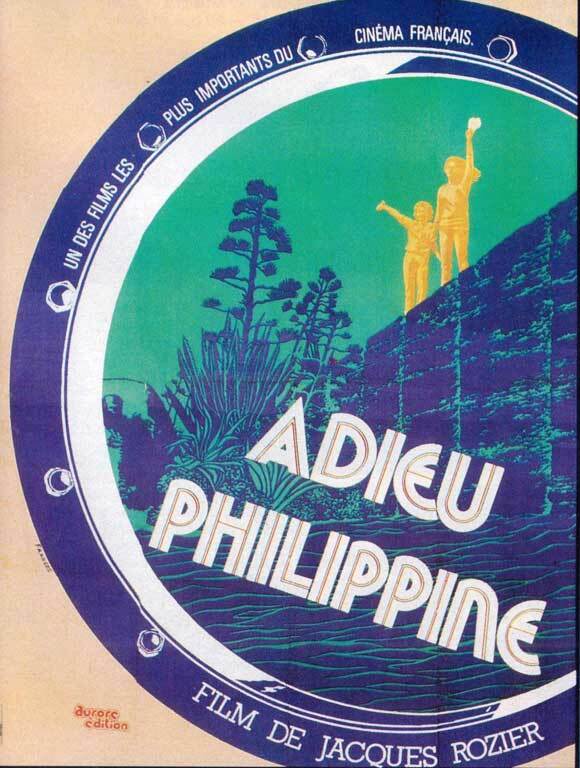 Adieu Philippine is on the one hand, chaotic and fun, and is a landmark film in many ways; it is unfortunately, however, a bit sophomoric and Rozier's inexperience as a beginning director shows. On the one hand, some of the visuals are beautiful and perfectly pitched: the lyrical interludes between scenes, such as the two girls walking along a summery Paris street set to the rhythm of a tango, are nearly perfect. But often the soundtrack swings into the territory of the garish: too much pop, overly loud – you can barely hear the girls talking in the restaurant in a scene which should have been very naturalistic – and there are huge chunks of the movie, especially after they return from the ‘adventure’ hunting down the deadbeat producer – which seem badly edited and misplaced. What was up with that very long hula-esque dancing sequence with the two girls in the holiday camp, for example? It didn’t contribute to the atmosphere and seemed to me stylistically gratuitous, dull. Overall, though, an enjoyable effort and impressive for a first feature film. There are some gorgeous mis-en-scene, somehow simultaneously imbued with both a kind of quiet reflectivity and a buzzing adolescent energy. The scene with the wasps on the pebble beach is lovely – Rozier is fantastic at capturing the naturalness and vibrancy of youth and at evoking a sense of real speech (although perhaps because much of the script was improvised). In any case, this is real youth, not a nostalgic rumination on youth. I’m not so sure I buy into the relationship between the two girls (they seem quite quick to become chummy with each other, for no particular reason, only moments after fighting bitterly over the same man), but perhaps their fickleness is a perfect fit for the kind of lovely, chaotic, capricious spirit of this film.